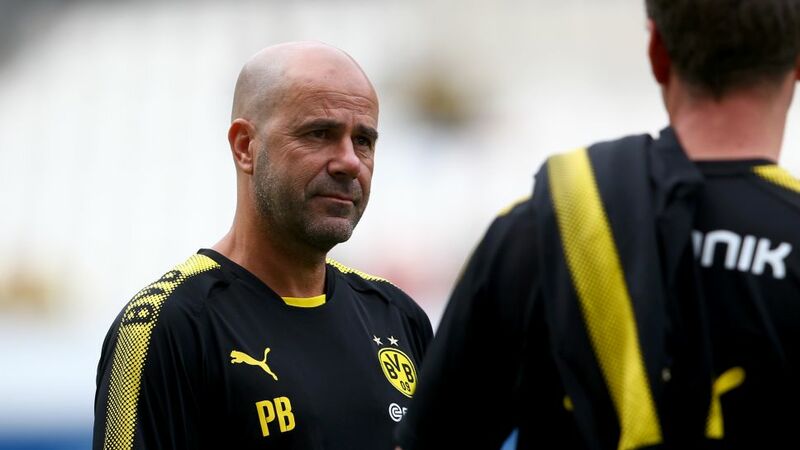 It was an inauspicious start to pre-season for Borussia Dortmund: new Dutch head coach Peter Bosz watched his charges slip to a 3-2 defeat against fourth-tier Rot-Weiß Essen in their first friendly of 2017/18 on Tuesday night. It was far from the ideal preparation for BVB's upcoming Far East jaunt as part of the Bundesliga World Tour 2017, but Bosz promised swift improvement and hard work in his post-match interview. Question: Peter Bosz, how disappointed are you after losing your first game in charge of Borussia Dortmund? Peter Bosz: Of course, I’m disappointed. Dortmund have to be beating fourth-tier opposition, even if they’ve had two or three weeks to train and we’ve only had four days. It was pretty poor from us. Question: What’s behind the poor performance? Was the team too tired? Bosz: I don’t want to look for excuses. Dortmund have to win here, even if the opposition plays as well as they did tonight. We simply have to do better, particularly in the first half when we were too slow and not aggressive enough. In the second half at least we managed to create some chances, but on the whole it wasn’t great. Question: Pierre-Emerick Aubameyang once again proved his worth, scoring and being involved in almost everything good going forward. Did you notice that as well? Bosz: I don’t think it’s right to talk about individuals after a game like this. Dortmund played badly and we were all to blame for that - I include myself. It should be said, though, that we have been training very hard in the first three days. Even so, you still have to win this sort of friendly. Question: Do you think there were physical issues, or did the players struggle to implement your philosophy? Bosz: It’s impossible to implement my philosophy immediately. It’s going to take a while, that’s what I can say. You can’t do it in three or four days, but we’ll work hard at it and pick it up. Question: You said earlier that you didn’t want to exclude yourself from criticism, what do you mean by that? Bosz: I’m also part of this team. I’m hardly going to stand up and claim the players did this or that wrong. I belong to the team as well. Bosz: I always do that at the start. If you want to sort something out, you need to have an exact picture of what it is. You have to look in detail at what the players are doing well, and what they’re doing badly. If I were standing on the touchline the whole time, then it’s a lot harder to observe that. On the bench I can judge things better with my assistants. Click right here for more Borussia Dortmund news!